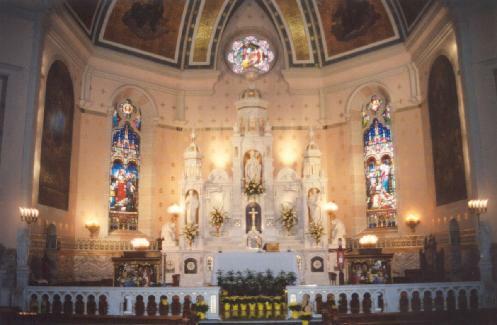 St. Stanislaus is the oldest Polish parish in the diocese of <?xml:namespace prefix = st1 ns = "urn:schemas-microsoft-com:office:smarttags" />Buffalo, and maybe the oldest in New York State (St. Stanislaus in NYC also founded the same year). The first pastor and founder was Rev. Jan Pitass, a Silesian who was the "irremovable pastor" for 39 years. 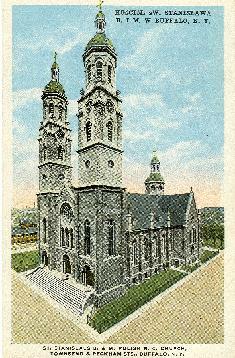 Pitass, the pioneer priest, is also considered the founder of the Polish American community in Western New York. A national known figure, he built an enormous empire for the Poles on the east side of Buffalo. He established a parish school and brought the Felician sisters to Buffalo in 1882, he founded a parish cemetery in 1889, co founded a national fraternal organization, Unia Polska w Ameryce and was responsible for the first Polish Catholic Convention in America. 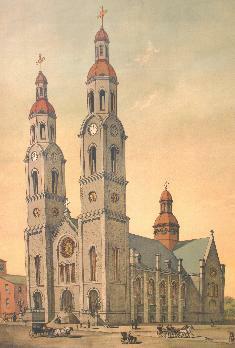 The magnificent cathedral type church that Jan Pitass built in 1882 stands as a lasting memory to his ability. He was an advisor to Bishop Ryan on Polish affairs and was granted the title of "Dean". In 1904, this parish was among the largest in the <?xml:namespace prefix = st1 ns = "urn:schemas-microsoft-com:office:smarttags" />U.S. with close to 20,000 parishioners. Two-thousand children were enrolled in the school. Upon his death in 1913, his nephew, Dr. Aleksander Pitass took over the reigns and guided the parish for the next 40 years, a period marked by two world wars and the beginning of the exodus of Poles to the suburbs. Dr. Pitass like his uncle commanded great respect and the parish was in the limelight of all Polish affairs. The Rev. Piotr Adamski followed as next pastor with the death of Dr. Pitass in 1944. Adamski's term as pastor brought the parish into its centennial year, just three pastors in 100 years! He made parish improvements and was responsible for the establishment of boy's and girl's catholic high schools, expansion and development of the parish cemetery, and the building of a social center. During his pastorate many Polish refugees arrived after the war but even with the new blood, the neighborhood's ethnic population was changing. After the celebration of the centennial, Adamski retired and the Rev. Chester Meloch was assigned as pastor. Msgr Meloch resigned the pastorate and the Rev. Msgr John Gabalski was appointed. The beloved Gabalski lead the parish until his death in 2003. In November of 2003 Bishop Edward M. Grosz was named only the 6th pastor of the historic parish. Under Bishop Grosz's leadership, St. Stanislaus has begun an aggressive series of capital improvements to stabilize and restore the parish campus.